iPhone, iPad, Mac & Me: Couldn't Fight The "Need For Speed"
Couldn't Fight The "Need For Speed"
I couldn't help myself. I was so pissed off at EA for delaying "Need For Speed: Undercover" [iTunes link] I was planning on boycotting it until there was a price drop. Well, I picked it up anyway. I find it ironic that this game is more like the movie "The Fast And The Furious" than the other iPhone game "Fast And Furious: Pink Slip." 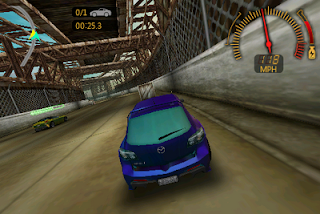 And F&F:PS is more of a racing game than NFS:U. Unfortunately, there is no straight racing in this game. You HAVE to follow the storyline. With that said, a few things bugged me about this game. A couple of events really had me livid: the one where you have to avoid maximum damage to the car you are delivering and the one where you have "catch" the car by hitting them. As I trudged through those events, I wondered if this was really a racing game. One thing I liked a lot is the ability to not only customize the performance of your car, but the LOOK. I chose the Mazda Mazdaspeed3. I customized the blue paint job, the spoiler, the rims and the racing stripe. How do you like it? I have to admit that I wish there were more way to customize but I hope there will be updates in the future. 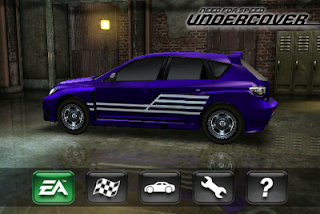 NFS:U is a pretty game and the driving animation is about the same as Gameloft's Ferrari game. But, I feel that $9.99 is a bit too much for this game.